How do you feel about needing Zidormi to change a zone's timeline? The other day, I was out and about collecting Coins of Ancestry from Elders for the new dragon pieces. Part of collecting all the Coins means you have to visit with Zidormi at various locations in both Kalimdor and Eastern Kingdoms to have her revert time backwards. 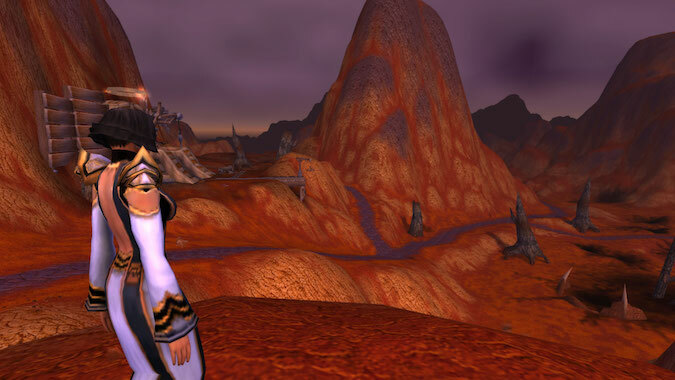 Fro example, the Blasted Lands (shown above) before the Warlords of Draenor invasion. I suppose it’s technically not a bother to hunt her out in each of the zones where she’s taken up residence — her chat bubble is marked on the map. So far, she’s in zones where — if you have flying — she’s relatively easy to get to. Plus, having this ability can add a layer to game play. It allows the developers to add content without having to design a completely new zone. The cataclysm changed the map. We awoke to a new land. Classic — when it gets released this summer — is going to bring back what the land looked like before Deathwing. Which version and overlay do you want? Azeroth before the bombing of Theramore or the sword in Silithus? The world has changed as we’ve experienced different expansions. I kind of want my low-level characters to have to navigate that changed world. I know it would be a development nightmare to redo quests and take into account a level-20 Night Elf running through a Horde-controlled Lor’danel. The ability to change the world back could also get horribly confusing, particularly for guilds/friends who do events together. We had a guild member get…that…one…sword from Silithus and those of us who have new Silithus had to truck over to Zidormi and set the world back so the quest giver was visible. And doing Hallow’s End, Winter Veil, Lunar Festival, or Noblegarden quests which involve destroyed or changed zones is a pain to get around. One guild member dislikes where Zidormi actually is relative to where things are in changed zones. Maybe this is just me. I’m okay with the changes done so far. They have advanced what I consider to be an intriguing story. How this is going to play out and the changes to the zones are necessary for that story advancement. Yet, I’m okay with that stopping now, too. How do you feel about this? Does it bother you to have to talk to Zidormi at holidays? Do you want to see more of this, or are you content with what’s been done? With the rumored impending naga invasions, I think we’re done with overlays — but who actually knows. One thing is for certain: There are a lot of Zidormis out in this grand world.